All transactions are safe and secure with a reliable history in online purchasing behind each of our associates. Buy the Saved by the Bell Slater shirt to own Saved by the Bell clothing and merchandise. This AC Slater Saved by the Bell t-shirt is a must have for fans of the TV show. 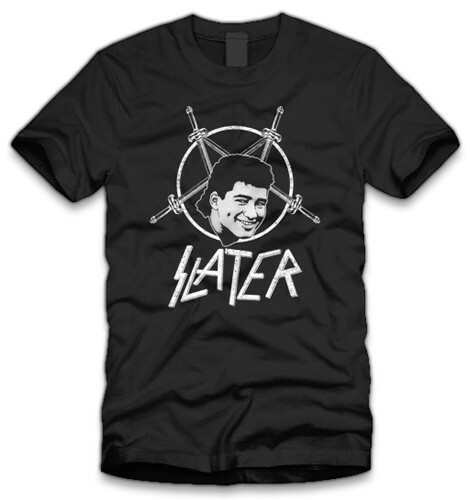 The front of this dark tee reminds the observer, don't be a Slater hater! Always remember that he would have your back just like you have his face on the front of this tee. You might even find yourself admiring his coolness when you look in the mirror. With a wink and a smile, tell your friends that you used to wrestle with AC Slater at Bayside back in the day. Albert Clifford "A.C." Slater could lower the temperature in any room, because of his extreme coolness. Wear this T with an A.C. Slater style Saved by the Bell hat. In addition to the Saved by the Bell Slater tee above, browse the Saved by the Bell Clothing Gallery for more apparel like men's and women's clothes, kids shirts or hoodies.